The task of deriving the diagnosis occupies a central position in the sequence of clinical patient care processes and the clinical work flow. An outline of the sequence and relationship of these Clinical Patient Care Processes is shown in the Work Flow Chart (or Critical Pathway) below. 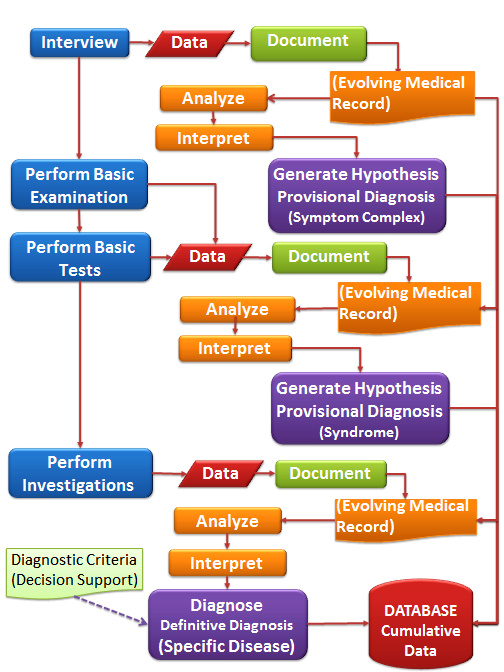 This generic workflow requires modification depending on types of cases. Diagnosis plays a pivotal role in clinical practice. It defines the needs of the patient, based on which decisions on the further management of the case are made . Arrange, collate, sort and group the data and present them in a structured manner as text, graphics or tables. Compare the pattern of manifestations in the patient with the clinician’s own past experiences or published common wisdom. Consider a possibility (hypothesis or postulate) and try to prove or dispel it based on the diagnostic criteria. The intricacies of the process of deriving or formulating a diagnosis are discussed in detail later. The accuracy of the diagnosis determines appropriateness of the treatment chosen. Therefore, when documenting a diagnosis, it is essential that the clinician state its level of accuracy or degree of certainty. The ability to deduce an accurate diagnosis is dependent on the completeness, relevance, quality and accuracy (objective vs subjective) of the available data. In general, the level of accuracy improves as more and more information become available. Qualifying terms such as provisional, working, presumptive, and definitive describe this degree of accuracy. The qualifier ‘final’ refers to the diagnosis at the end of a visit and does not reflect its accuracy. Information provided by the patient is subjective but is important because it describes personal experiences including past events, which cannot be obtained from any other source. The patient also expresses what he/she thinks is his/her problems and needs. Information provided by people, who care for, live or work with the patient or is an eyewitness to the presenting event, can be very useful. However, the clinician should be aware that the information provided is subjective, often inadequate and may not be very reliable. Subsequently, the clinician uses more reliable methods of gathering data that gives objective information such as direct observation and tests. Tests that give specific information concerning a disease are used to clarify the diagnosis and are called diagnostic investigations. Usually, diagnosis becomes increasingly more accurate as care progresses. Hence, at the beginning, the clinician may document the diagnosis as a symptom complex or syndrome or disease class. At a later part of the episode of care, it is often possible to state the diagnosis more explicitly as a specific disease. It is crucial for the clinician to qualify the diagnosis by its degree of certainty or accuracy level because it has bearing on the choice of subsequent steps in the care process. It determines the need for obtaining further information from investigations, monitoring and reassessment. Treatment to relieve symptoms, correct physiological derangement and psycho-social upset should be started even before an accurate diagnosis is made. The definitive treatment need to be based, as far as possible, on an accurate diagnosis. Yet sometimes, it is necessary to start definitive treatment early based on the presumptive diagnosis, despite the lack of accuracy. Note that in both instances, these are possibilities or hypotheses as yet to be proven. The Provisional diagnosis is what the clinician considers as the most likely among the probable (i.e. differential) diagnosis. The term Provisional refers to its “interim” or “temporary” nature because it is inferred from the latest cumulative but yet insufficient data, prior to a more definite diagnosis. Traditionally, the diagnosis made after the initial clerking (history taking, physical examination and simple clinical tests) is regarded as the Provisional diagnosis . When used as the basis for clinical management of a patient, the Provisional diagnosis is often termed as the Working diagnosis. Over time, as the diagnosis becomes clearer, the working diagnosis also changes. A Presumptive diagnosis is the diagnosis that the clinician uses to initiate definitive treatment despite the inability to determine a Definitive diagnosis. The decision to start definite treatment is made after considering the high probability of the diagnosis being eventually correct, especially when the treatment is relatively safe but delaying intervention may lead to serious complications. The treatment plan should be considered as tentative and altered as soon as the diagnosis become more definite. Both the clinician and the patient should be aware of the risks involved. The accuracy of diagnosis at any point depends on the adequacy and reliability of the data available. Therefore, the clinician is allowed to document diagnosis as either health problems, symptom complexes, syndromes, Diagnostic Related Groups (DRGs) or disease conditions. It is not logical for clinicians to state the diagnosis as a specific disease entity when there are insufficient facts to substantiate it. A symptom complex is a combination of symptoms (what the patient experienced) occurring according to a particular pattern and in the context of a particular scenario that is typical of a health problem, . Well known examples are Dyspepsia and Charcot’s triad. In another example, dysuria, urinary frequency, urgency, pain in the suprapubic area and cloudy urine can be termed as “cystitis” ascribed to inflammation of the bladder or urethra. It may not mean a bacterial infection, although infection is probably the commonest cause of this symptom complex. When there is an overriding symptom and little else, the symptom itself can be given as the diagnosis e.g. Fever of Unknown origin or Fainting attacks – query cause. In the context of this discussion, a syndrome is a typical set or pattern of manifestations (group of symptoms, signs and test results) attributable to diseases affecting a particular body region, a physiologic system or of a particular aetiology. It is the common manifestation of many possible diseases (e.g. Obstructive jaundice, Bleeding disorder and Upper Gastrointestinal Bleeding). In another example, the term epileptic fit or seizure refers to a syndrome. It is defined as “a cluster of seizures, other symptoms, physical,signs,and laboratory findings, which are associated in a non-fortuitous manner“. It does not necessarily mean that the patient has the disease ‘Epilepsy’. If the set of manifestations is unique to a certain disease, it is no longer a syndrome in the strict sense of the word. The term syndrome in these instances refer to a specific disease (e.g. Down’s Syndrome, Carpal Tunnel Syndrome). Documenting the provisional diagnosis in the form of symptom complexes or clinical syndromes or disease class (syndromic diagnosis) is acceptable and should be encouraged. The actual diseases that may give rise to these syndromes or symptom complexes are thought of as the differential diagnosis. Also, the differential diagnosis can be a list of syndromes rather than specific diseases. EXAMPLE 2 depicts a syndrome that is a common presentation of variants of the same disease. The disease Atherosclerosis of Coronary Vessels and subsequent thrombosis gives rise to varying degrees of acute ischaemia of the myocardium. Based on symptoms and signs alone (chest pain, tachycardia and tachypnoea) the illness can be called Acute Coronary Syndrome. The true nature of the severity of the ischaemia and the resultant damage to the myocardium are determined by Electrocardiography findings and the levels of different types of enzymes released into the bloodstream. The differences in the pathology and manifestations are significant enough for them to be considered as different variants of the same disease and given different names (ST elevation Myocardial Infarct or STEMI, Non- STEMI, Unstable Angina and Angina Pectoris). Each variant of the disease mandates different care plans or treatment protocols. In EXAMPLE 1, the presence of symptoms of yellowish discolouration of skin, tea-coloured urine, itchiness, the finding of deep jaundice, raised serum conjugated bilirubin and markedly elevated serum alkaline phosphatase level may be termed as Obstructive Jaundice. The differential diagnosis is a list of different diseases that can present in the same way. The diagnosis of the actual disease is made when further investigations such as biochemical and immunological tests, Ultrasound examination plus Endoscopic Retrograde Cholangiogram (ERCP) or CT Cholangiogram are done. Another method of documenting Differential diagnoses is to state the Provisional diagnosis followed by a list of possible other distinct diseases as the Differential diagnosis. Here, the clinician chooses the most likely specific disease as the Provisional diagnosis and other specific diseases (pathologic entities) listed in descending order of probability as the Differential Diagnoses. According to this approach, the Provisional diagnosis is actually one of the differential diagnoses. The clinician probably created the list based on a symptom complex or syndrome that he/she has in mind. Although many clinicians prefer to name a specific disease as the Provisional diagnosis, it may not be advisable because it may mislead others to assume that a definite diagnosis has been made. They might then treat the patient according to a presumptive rather than tentative care plan. The provisional diagnosis should be documented as a specific disease only when the presenting symptoms and signs are unique to the disease or if the specific diagnostic investigation result peculiar (diagnostic) to the disease is positive. In EXAMPLE 2, despite a specific disease being given as the Provisional diagnosis, the clinician is actually considering the syndrome consisting of pain in the right lower abdomen, nausea, vomiting, fever and tenderness in the right iliac fossa. Traditionally, clinicians use the term “Acute appendicitis” for the Provisional diagnosis, despite knowing that it could be any one of the problems listed, Acute Appendicitis being only one of the possibilities. The type of diseases named as the differential diagnoses depends on presence of certain symptoms and signs, the distribution of the area of tenderness and the patient’s gender. The diagnosis of Acute Appendicitis is made after surgical exposure. In EXAMPLE 1, the symptoms and signs (wheezing, dyspnoea tachypnoea and rhonchi) can be attributed to a variety of diseases. The care provider need to have an open mind with regards the possibilities. Perhaps, it may be better for the Provisional diagnosis to be given as Acute Lower Airway Obstruction (i.e. a syndrome). Until recently, the diagnosis of Acute Appendicitis is based on the presence of a complement of typical signs and symptoms. However, patients are now presenting at an early stage when the symptom complex consists of only pain and perhaps nausea. The symptom complex could perhaps be called “Pain in (lower or mid) abdomen syndrome”. The symptoms and signs then are less classical and therefore further observation, consultation and investigations (such as Ultrasound, CT Scan) may be necessary to obtain the correct diagnosis. There are instances where the diagnosis is clear based on history and signs alone. Therefore, it is unnecessary to name other possibilities. Suspicion of the possibility of a particular diagnosis should alert the clinician to observe for emerging symptoms and signs or to perform or request for appropriate tests. Including a disease in the list of Differential diagnosis raises the alert level. It is customary, to distinguish the Provisional/Working diagnoses by documenting them separately from the Differential diagnoses. The clinician must be aware that it is still just another alternative diagnosis in as much as the patient may or may not have the disease. A diagnostic “label” should not preclude further efforts towards obtaining a more accurate diagnosis. A point may be reached when with sufficient data the disease recorded initially as one of the differential diagnoses will prove to be the correct diagnosis and will replace the one recorded earlier as the working diagnosis. Hence radiological diagnosis, endoscopic diagnosis, post-operative diagnosis, histological diagnosis can be variants of Definitive diagnosis, in as much as the diagnostic tools used enable a confident conclusion to be made on the nature of the disease. If a Definitive diagnosis is reached, then a definitive case management plan can be undertaken. Lessons learned from an encounter with a patient having a particular disease, is retained in memory. When faced with a similar case, the clinician is alerted to and reminded of the possibility of a similar diagnosis (often sub-consciously). Therefore, a senior clinician, with long experience of managing many patients, would be more likely to diagnose a problem correctly than a person with just good theoretical knowledge. During their training clinicians are taught to associate certain mix of symptoms and signs with certain diseases. These alert them to the possibility of certain diseases, even if they have not encountered the disease first hand. When deriving the diagnosis in this way, the clinician should remain skeptical and consider his conclusion only as a possibility. He should still consider a differential diagnosis and obtain confirmatory data to support the diagnosis. Perhaps this approach is a prelude to the hypothetico-deductive approach. To arrive at a diagnosis, clinicians often postulate various possibilities (syndrome or specific disease) and then try to determine whether the clinical data of the patient satisfies the diagnostic criteria of each in turn. The clinician makes an initial hypothesis based on deductions derived from the available data and his/her knowledge of anatomy, physiology, pathology and disease processes (the natural history of the disease). He/she must then seek the additional data required to prove or disprove the hypothesis. After more data is obtained, he/she may stick to the hypothesis or postulate another. The adequacy and reliability of data available to the clinician depends on the skills of interviewing, eliciting signs, choosing the right diagnostic investigations and making observations. The clinician obtains relevant and pertinent information by asking the right questions. The data from history taking provides an indication as to the need to discover or elicit certain expected signs. By keeping an open mind the clinician also takes note of any findings that he / she comes across that do not fit into the early hypothesis. Next, deduction based on the additional information obtained from physical findings should give rise to an altered or new hypothesis guiding him to select the appropriate investigations. Results of tests and investigations together with the accumulated data can either clarify the diagnosis or lead to different hypotheses. The definitive diagnosis is made when there is sufficient and accurate data to satisfy the diagnostic criteria. The clinician obtains data incrementally. Initially, he/she has to contend with data that is incomplete or of lower accuracy. Yet, it is imperative that a conclusion is made and appropriate action is taken even at this early stage. 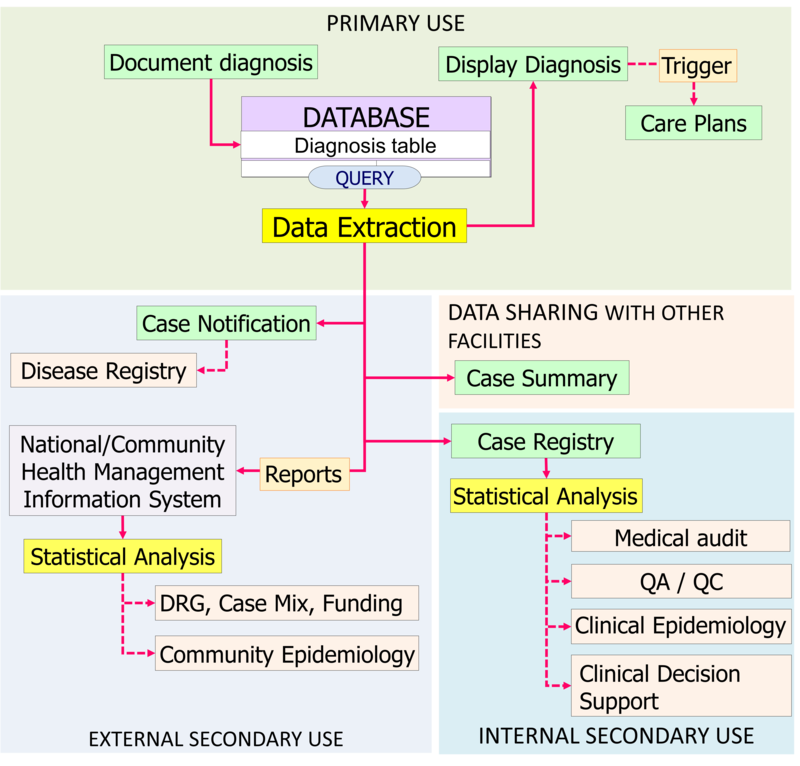 The raw data is arranged, evaluated, aggregated, integrated and categorized, with the aim of finding some coherence and convergence that would point towards a particular diagnosis. The clinician does this by proposing (to him/herself) a possibility (hypothesis) and attempt to verify whether the hypothesis is plausible. This act of hypothesis testing may reveal that the data is insufficient and prompt the clinician to seek for more data. Successful analysis and interpretation requires a methodical approach complemented by experience and persistence. The character Sherlock Holmes created by Sir Arthur Conan Doyle probably used both approaches mentioned above in solving various mysteries. Experts or professional organizations have developed and published formalized diagnostic criteria for various diseases. They base the diagnostic criteria on the observation or audit of a substantial number of cases. Certain criterion always occurs and acts as a mandatory or primary criterion i.e. it must be present if the diagnosis is to be made. Some criteria may or may not occur either frequently or less frequently (secondary or non-mandatory criteria). In certain situations, a single criterion may be diagnostic of a disease. 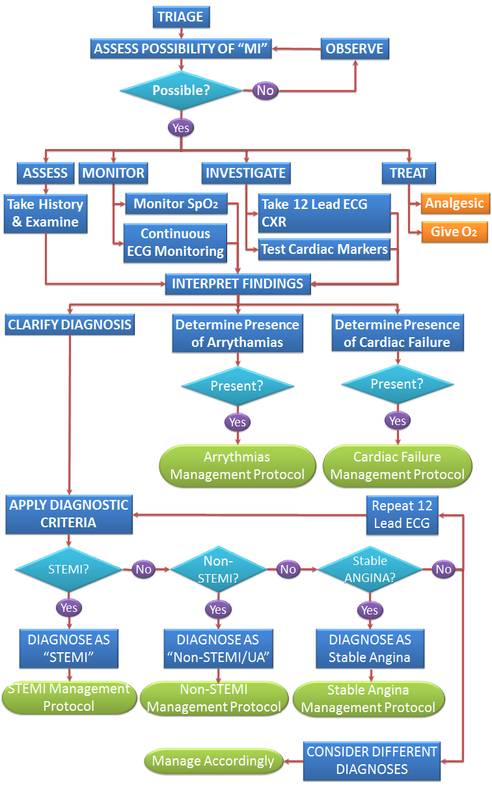 In most instances, it is the occurrence of a combination of a predetermined set of criteria (the diagnostic criteria) that determines the certainty of diagnosis. To create an objective method, clinicians may assign a score to each criterion. Some criterion is given greater importance by assigning weightage (arithmetic value) to it. Even in the absence of standardized and formalized diagnostic criteria, the concept of considering whether data matches what is expected is an important guide to making a diagnosis. The clinician must be aware of how he/she make decisions and why he/she comes to the conclusions in general and for particular cases. He/she need to be on guard against his/her own prejudices, pride in making a quick diagnosis, bias towards a diagnosis within his area of interest, a need to recruit cases for studies, inability to exercise professional detachment for relatives, friends, very important persons (VIP) and so on. He/she should assess the quality and adequacy of data, and should question whether all data have been taken into consideration when the diagnosis was made. This ability to question one’s own mode of thinking is called “meta-cognition”. Often, a clinician realizes pitfalls in thinking when a major mistake is made. Major mistakes sticks in memory and the lesson learned is not forgotten. However, to be a good diagnostician a clinician should have a keen interest in comparing his/her own initial diagnosis (and the analysis and interpretation that goes with it) with the diagnosis made by more definitive means (laboratory or imaging findings, findings at surgery, biopsy or post-mortem examinations) or that made by an expert. The patient’s outcome is perhaps the ultimate indicator of diagnostic accuracy and completeness. However, success is not dependent on a good diagnosis alone. Failure may be due to the wrong choice or improper execution of the treatment modality or lack of compliance by the patient. Sometimes certain striking symptoms, signs or situations exert an undue influence on the clinician in making the diagnosis. These take attention away from other data and somehow cloud the judgment of the clinician, leading to rash conclusions and decisions. Clinicians often take pride in making a “spot diagnosis”. Intuition or gut feeling should always be tampered by a careful examination of the available data. “Common things happen commonly” is an often repeated dictum. Yet, some clinicians have the propensity to diagnose rare conditions before considering the more common. This tendency may arise because rare conditions stick more clearly and longer in memory. Also because academic institutions often manage the more difficult and rarer conditions, clinicians in training may actually be more familiar with uncommon conditions and not common ones. It may also emanate from the need to discover, to publicize and perhaps to publish. This pitfall may be avoided by inserting the rare condition within the list of differential diagnosis, perhaps at a lower level in the order of probability. Rare conditions do occur. It would be detrimental to the patient if the clinician makes the diagnosis late after spending time discounting the common possibilities. Therefore even rare conditions should come into the list of differential diagnosis when symptoms, signs or initial tests call for their inclusion. Yet, the clinician would consider rare conditions only if he/she is aware of its existence. Therefore he/she need to have knowledge about rare diseases within his/her domain. It would be difficult for a generalist e.g. general practitioner or primary care physician to be familiar with uncommon conditions. Specialists would also be unfamiliar with conditions within other specialty areas. To avoid delay, it is important that consultations with specialists more familiar with certain less known diseases are made earlier rather than later. For example, it would not be a discredit to a physician to consult with a surgeon to rule out the possibility of a disease that the latter is more familiar with. Conditions considered rare to clinicians working in one specialty area may be quite “common” to those working in another specialty. Often, the possibility of an uncommon diagnosis becomes apparent only after investigations have ruled out the common conditions. At this point, it is imperative that the clinician considers less common conditions by referring to the literature or to consult other clinicians. Most symptoms have numerous possible aetiologies. For example to a surgeon, vomiting makes him think about gastrointestinal tract obstruction. To an endocrinologist or a neurologist, the symptom signifies different possibilities. Clinicians should be aware of their own limitations and have the humility to consult. The natural history of a disease refers to development of a disease over time, without medical intervention, characterized by the pathogenesis, the different effects it has on the patient leading to various clinical manifestations, progress and endpoints. Patients seek treatment at different stages of their illness. It is not sufficient to understand only the “classical” presentation of an illness but it is also necessary to know the different modes of manifestation at the different stages. The good clinician should be able to diagnose a patient at the early stage of the disease. He may have to resort to performing investigations with a detection level of high sensitivity. However a sensitive test may not be very specific. Too much reliance on tests may lead to over-diagnosis and thereby over-treatment. On the other hand, patients may present very late. The existence of complications clouds or masks the actual diagnosis. The clinician is apt to diagnose the complication (usually a syndrome such as shock, septicaemia, renal failure or cardiac failure), rather than the disease that causes it. Patients often have received some sort of treatment before a proper diagnosis has been made. The patient may hide this fact. It is imperative that this history is asked for. Self-treatment or treatment by alternative medicine practitioners or other clinicians often alters the natural history of the disease. The presentation at the time of the encounter with a subsequent care provider could be atypical. The clinician needs to take cognizance of these when attempting to make a diagnosis. The earlier treatment may result in incomplete or temporary arrest of the disease. If this is not realized, an opportunity for early and proper therapy is missed. The Final diagnosis is often thought to be the most accurate diagnosis. This is not necessarily so. If no investigations are done (because patient refused, absconded or died) or results are yet to be obtained or are not conclusive, the Final diagnosis is in no way definite but have the accuracy level of an interim diagnosis. Yet, in the medical record, the Final diagnosis needs to be documented at the end of a care visit. So, in a care episode there will be a Final diagnosis for each visit. A time may come when the diagnosis finally becomes definite; otherwise it remains inconclusive even at the end of the care episode. Clinicians often apply the concept of Provisional and Definitive diagnosis to the primary illness only. Logically it should be applied to the Concurrent illness and Preexisting illness as well. This more comprehensive diagnosis provides a clearer perspective of further assessment and management. What is the patient’s main problem? What other illness befall the patient at the same time? What is the patient’s premorbid status? Did he/she have illnesses in the past that had not been or could not be resolved? Can all of the patient’s symptoms and signs and his/her general condition be explained by the illness identified as the diagnosis? Could it be due to more than one cause? For which of these problems, is the diagnosis certain and therefore treatment has or can be initiated? Any disease that still affects the patient in some way is a current illness. Past illnesses are those that had resolved completely and no longer affecting the patient. However, those that have not resolved should be termed as Unresolved Previous illness. If it results in persistent abnormalities of function, disabilities and handicaps, these are also part of the Current illness. In the medical record, Past illness is mentioned in the Past history section, thus indicating past illness as historical. An incurable or unresolved Chronic Disease discovered in the past is current and should be termed as a Pre-existing illness. implants (e.g bone fixators, pacemakers, cardiac valves and artificial lenses) have been inserted at previous surgery. The Present illness is the disease or condition that have recently developed and for which the patient seeks the present encounter with the care provider. It may be a new disease or a chronic illness for which the patient is obtaining help for the first time. There may be one or more present illness. If there is more than one, the clinician considers the more important illness as the Primary Present illness, by considering the impact on the patient, potential risks or severity. Other illnesses are secondary but better termed as Concurrent illnesses. For example, a patient with Acute Coronary Syndrome may also have Reactive Depression. There may be scenarios where the present illnesses are equally important. The differentiation between Primary and Concurrent does not imply neglect of one over the other. Indeed both need to be given equal attention. There may be some differences in priority and urgency. A patient may have an abscess but if he/she also has diabetic ketoacidosis, the latter is the more pressing problem requiring urgent treatment. Drainage of the abscess is performed after the patient has been resuscitated. A Concurrent illness must be differentiated from a Differential Diagnosis. It is a different problem, which may have its own differential diagnosis. There are instances, of course, when more than one illness is suspected but actually the manifestations originate from a single illness or health problem. Pre-existing illnesses can be identified at the time of clerking if the patient is already aware of them. When there is no previous history, common chronic illnesses should be screened for as part of patient assessment through clinical and investigative means. Quite often patients do not seek treatment and advice for various ailments or health deficit. This is because either they consider them trivial or did not realize that medical help is necessary and available. The characteristics of the illness may be obvious from the presenting signs and symptoms or determined through further investigations. The clinician should try to put these together and come to a plausible conclusion. This categorization is based on the speed of development of the disease often determined by the time taken for serious effects to occur and for the patient to seek treatment. Each category has its own significant characteristics in terms of presentation, monitoring, plus urgency and choice of treatment. Priority is not an issue of diagnosis as much as that of treatment. Yet it is customary and often required for statistical purposes to distinguish the main or Primary Illness from other illnesses. A reporting form for epidemiological purposes often have one data field to be filled for the Primary Illness. Choosing the unique recently acquired/detected illness as the primary illness would be convenient for the counting of occurrences. It is also often necessary to label a patient according to one particular diagnosis for e.g. for streaming the patient for admission or allocation to the right clinical unit. For example a diabetic patient with an abscess is streamed to the Surgical Unit (as the primary care provider) even though the diabetic status may take precedence in treatment. For purposes of treatment however, which aspect of the illness that need to be given the most attention is the issue. In many diseases the physical, physiological and psychological effects of the disease determines the priority rather than the cause of the disease itself because all these effects add up to the severity of the disease. Deciding on the choice of the most appropriate treatment modality and the sequence of treatment. The stage of an illness is mainly the function of time. The longer the duration of an illness the more advanced is the pathological process. This may not mean that the patient is sicker because time may have allowed the disease to resolve e.g. in injuries and inflammations. Time also allows the disease to spread. A disease like an infection or a neoplasm may be staged according to local, regional, systemic and distant spread. Grade refers to the degree of pathogenicity of the causative agent. In the case of infections, it refers mainly to the virulence of the causative organism. The grade of a malignancy refers to the tumour cell type and its potential to spread. In the case of chemicals or physical agents it may refer to the concentration, degree of exposure or force of the trauma. The most important determinant of the severity of most illnesses is the degree of derangement of structure, physiology, and the nutritional, psychological and social status of the patient. Hence, diseases can be categorized according to Severity Levels based on these. Often the term Severity Grade or Class is also used. Clinicians also predict and categorize the severity according to the potential for complications. Such categorization is called Risk Stratification. For some diseases, categorization of severity has been formalized. The differences between Dengue Fever, Dengue Shock Syndrome and Dengue Hemorrhagic Fever is a good example of grades of a disease. The three types differ mainly because they are the same disease with different type of complications, one being more serious than the other. 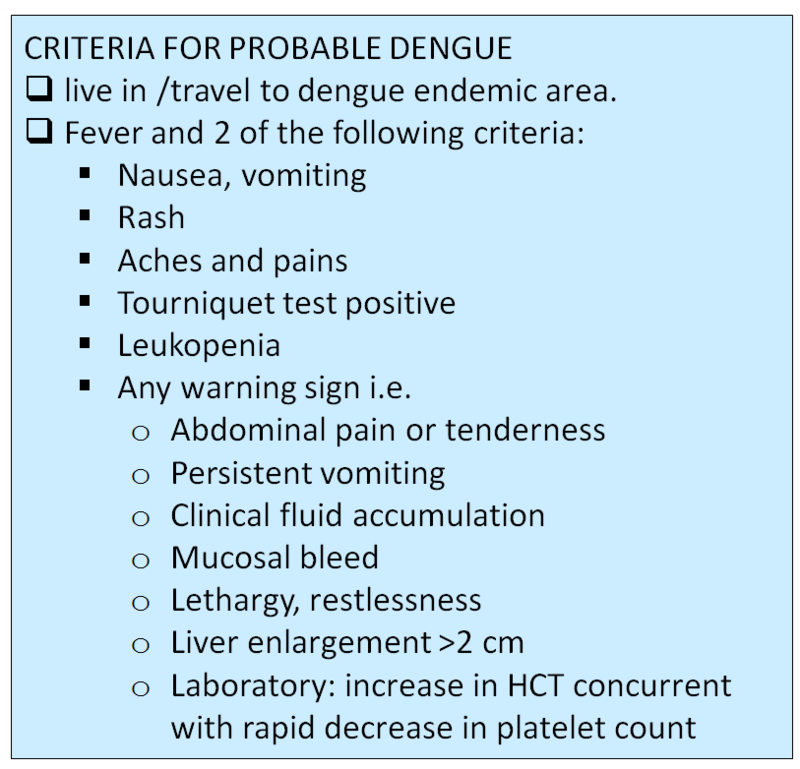 Patients affected by the disease of Dengue Shock Syndrome exhibit the complication of loss of fluid from the intravascular compartment culminating in and “Dengue Hemorrhagic Fever” which manifest as haemorrhage. This difference in the degrees of severity with variation in presentation is a good example of severity levels, except that it is often categorized into grades when it is actually the stages in the progress of the disease. Therefore, this is also a good example of how categories, levels and grades have been used interchangeably and often wrongly. On the other hand if the causative organisms (virus) are different variants of the same virus (perhaps due to mutation) giving rise to differences in virulence, then the term grade is applicable. An accurate and complete diagnosis is the key to the selection and priority of treatment strategies. Therefore it is perhaps the main factor determining outcome of patient care. Deriving a diagnosis involves cognitive skills in the manipulation, analysis and interpretation of data. This requires skills in comparing information gathered with current knowledge regarding health and illness. Every clinician should take on the challenge and aspire to be a good diagnostician. In the above example, with the complete understanding and articulation of the disease, the clinician can initiate and prioritize treatment aimed at rehydrating the patient, treating the Acute Renal Failure, the anaemia and the sepsis. Treatment of DIVC is started as soon as results of investigations confirm their presence. 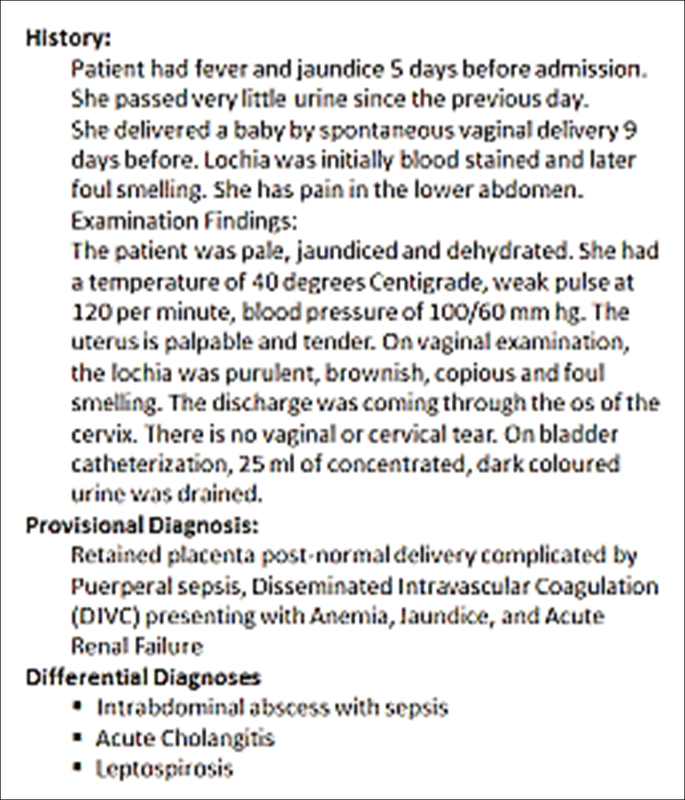 Surgical treatment of the retained placenta must wait until she is more stable but is the key to curing her illness.Note that even though the clinician had not performed the investigations he/she is able to infer the existence of complications by comparing the manifestations in the patient with the knowledge of the natural history of the condition of retained placenta and sepsis. The medical certificate of cause of death (death certificate), as recommended by WHO, is used mainly by health authorities for purposes of disease prevention. However it is also sought by other secondary users including medical record officers and researchers, for purposes beneficial to them. Clinicians or the hospital’s clinical governance may use the data in clinical audit especially the Mortality and Morbidity review. A different official certificate named as the Death Certificate is used for purposes of law enforcement by law enforcers, lawyers, and insurers. The form and content of this is defined by the law of the country concerned.